Budesonide improves the prognosis of chronic rhinosinusitis (CRS). However, few reports have examined whether its use for nasal irrigation, compared to normal saline, improves the prognosis of patients after endoscopic sinus surgery (ESS). We compared the effects of nasal irrigation with budesonide and normal saline in CRS patients after ESS. Sixty CRS patients who had undergone ESS were randomly divided into an experimental group (30 patients), which used budesonide nasal irrigation, and a control group (30 patients), which used normal saline nasal irrigation. All patients received regular follow-up evaluations and were assessed via questionnaires, including the Lund–Kennedy endoscopic score (LKES), the symptom visual analog scale (VAS), the 22-item Sino-Nasal Outcome Test (SNOT-22), the Short-Form 36-Item Questionnaire (SF-36), the Self-Rating Anxiety Scale (SAS), the Self-Rating Depression Scale (SDS) and a side effects scale. 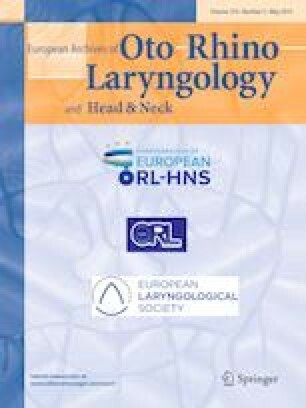 Scores of polyposis, mucosal edema, secretions and total score of LKES; VAS scores of nasal blockage, hyposmia and rhinorrhea; and SNOT-22 results in both groups were significantly improved 3 months after ESS. Scores of polyposis, mucosal edema, secretions and scarring and total score of LKES in experimental group were significantly better than in control group 3 months after ESS. No significant differences were observed in SF-36, SAS or SDS before or 3 months after ESS within or between the two groups. The side effects of the two groups were not significantly different. Nasal irrigation improved the prognosis of CRS patients after ESS. Budesonide nasal irrigation had a better effect than normal saline nasal irrigation. Zi-zhen Huang and Xian-zhen Chen contributed equally to this article. We thank Xi-fu Wu, Luo-ying Yang and Shuai-xiang Li for their help in collecting and processing clinical specimens. This study was supported by the Program of the National Natural Science Foundation of China (NSFC 81371073, 81670913), the Science and Technology Planning Project of Tianhe District, Guangzhou, Guangdong Province, China (201409KW027), and Medical Scientific Research Foundation of Guangdong Province (A2015312).